This article is about the faction in Tribunal. For the vanilla Morrowind faction, see Dark Brotherhood. For generic assassin NPCs in the Tribunal faction, see Dark Brotherhood Assassins. For the starting quest involving them, see Dark Brotherhood Attacks. The Dark Brotherhood is a guild of assassins shrouded in shadow and mystery which has been active all over Tamriel. While their business is certainly not legal, their existence has typically been tolerated or ignored. Whenever an individual with legal authority takes an interest in their dealings, the Brotherhood relies upon a combination of bribery, blackmail, coercion, and murder to keep their activities hidden. They have been bitter rivals of the Morag Tong since the Second Era. 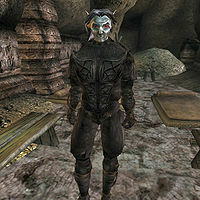 The Brotherhood is also known for their worship of the Dread Father Sithis (personified chaos, also known as the Void). Dark Sisters are accepted into the Brotherhood as equals of Dark Brothers (though members of either gender are often referred to as Brothers). All of those added by the Tribunal expansion are male. The Dark Brotherhood is an unjoinable faction. They are based in Old Mournhold and you will encounter them in the Main Quest of Tribunal (in two sub-quests; see below). In Tribunal (as in TES4: Oblivion), they have their own set of armor, though their boss, Dandras Vules, does not wear the helm, making him recognizable among their number. There is only one member of the Dark Brotherhood who is actually coded in the CS as being in the faction: Dandras Vules. He is of rank Dark Brother, only fairly high in the guild. In his dying breath, he indicates that he does answer to someone else, without saying whom. Though he may have been referring to his client, "H.", that honor would ultimately go to the Night Mother, Severa Magia – or her not-in-game replacement if you've already killed her. (The title "Night Mother", derived from a mythological figure, is used as equivalent to Guildmaster; this becomes clearer in the sequel game, Oblivion. Regardless, Magia's title is not coded as a faction rank ID.) However, given that the Brotherhood is, in lore, largely a continental organization and only just starting to make inroads onto Vvardenfell, against rival assassins the Morag Tong, it is likely that Vules answers to an unknown Master Assassin on the Tamriel mainland, since Magia is a long way from Mournhold. Because the Dark Brotherhood does not technically exist as a faction in the game code without the Tribunal expansion, none of the vanilla Morrowind NPCs associated with the Dark Brotherhood are listed as members of it in the CS, and estimating their exact ranks within the organization remains conjecture. Other Tribunal NPCs who have had at least business relationships with the Brotherhood are King Hlaalu Helseth, and possibly Queen Mother Barenziah. 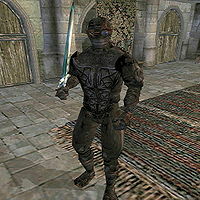 The Dark Brotherhood Assassins are a set of masked, hostile, generic NPCs of Assassin class, all of whom are members of the Dark Brotherhood faction [in lore only – see the Bugs section]. See Dark Brotherhood Assassins § Assassin Stats for these NPCs' details. They will randomly attack the player character sometimes while using the Rest function, if you are sleeping anywhere but the Census and Excise Office in Seyda Neen. These attacks persist (and slowly increase in frequency and ferocity) until you go to Mournhold to start looking for the Dark Brotherhood's hidden lair. See the Dark Brotherhood Attacks quest for details. They populate (and respawn in) a secret base in the Manor District of Old Mournhold, accessed via the Bazaar Sewers under Mournhold's Great Bazaar. Your goal is to find and kill boss Dandras Vules, and get a revealing document from him. See the Hunt the Dark Brotherhood quest for details. Due to an oversight, the masked, generic assassin NPCs are members of this faction as a plot/lore point but are not actually coded in the CS with any faction ID, though they do have their faction ranks set. This page was last modified on 15 January 2019, at 16:08.